“Solo: A Star Wars Story” is the kind of prequel we think about when we think about unnecessary prequels. It's a fill-in-the-blank motion picture, which rigorously catalogues everything we already know about Han Solo from the previous “Star Wars” movies and then works backwards, explaining every little unnecessary detail, and in such a short amount of time that it plays like an extremely elaborate joke. Alden Ehrenreich (“Hail, Caesar!”) plays young Han Solo, a dashing but inexperienced rogue who yearns to escape his oppressive home planet with his girlfriend Qi'ra, played by Emilia Clarke (“Game of Thrones”). 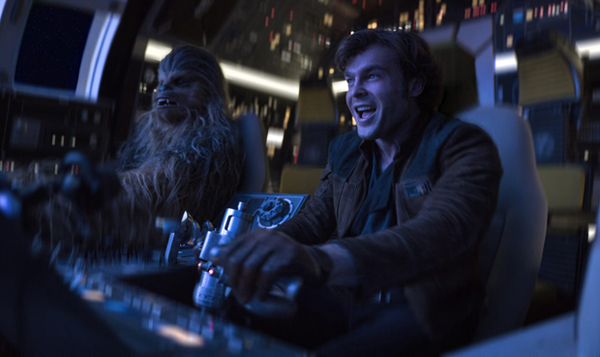 They get separated, and Han ends up bumming around the galaxy with the Empire, where he meets his best buddy Chewbacca (Joonas Suotamo) under - shall we say - some unusual circumstances. Eventually they join a band of outlaws led by Tobias Beckett (Woody Harrelson), who recruit them for a dangerous robbery, stealing fuel from a giant mountaintop monorail. When that heist goes pear-shaped, they have to perform yet another heist, a nearly impossible heist, along with a dapper young Lando Calrissian (Donald Glover) and his droid co-pilot L3-37 (Phoebe Waller-Bridge), who dreams of leading her people in a rebellion against their organic oppressors. It’s a decent idea for a story, even though it's distractingly reminiscent of the last “Star Wars Story,” which was also a prequel about space thieves and their persnickety droid, who steal an impossible MacGuffin while filling in the narrative gaps between the two trilogies. The biggest difference between “Solo” and “Rogue One,” however, is that “Rogue One” was a grim war story and “Solo” is a self-aware, breezy caper flick. If only it had been filmed that way. Picture, if you will, the opening sequence from “Indiana Jones and the Last Crusade,” in which young Indiana Jones stumbles into his first archaeological adventure and in which, over the course of a breathless chase through a train carrying particularly deadly circus animals, every single thing that we know about Indiana Jones suddenly comes crashing together. His fear of snakes, his love of a bullwhip, even Harrison Ford’s trademark scar all have an origin story, even though they never needed it. It’s exciting but it’s also hilarious, because the idea that every single one of a person’s defining characteristics would emerge from a single, solitary anecdote is fundamentally preposterous. “Solo” plays like that sequence from “The Last Crusade,” but it’s feature length now, and all the moments which should be whimsically the nose are, instead, taken dead seriously. “Solo: A Star Wars Story” relies, in almost every scene, on the audience's fandom. You absolutely have to be aware of what will eventually happen to Han Solo and his best buddy, Chewbacca. We know that when we first see Lando's ship, the Millennium Falcon, that Solo is going to win it in a card game. We know that this ship, which looks shiny and new, won’t always look that away. And we damn sure know that we’re about to see how those things happen, and a bunch of other formerly minor details besides, which makes the whole movie seem like a foregone conclusion. It’s simply an ineffective way to deliver drama. If we knew nothing about Han Solo and Chewbacca and Lando, these story elements would be relatively meaningless. They’re only important because we know they’re important later, in other movies. The movie demands our foreknowledge, and it demands such detailed foreknowledge that it could only work like a running, nerdy gag instead an actual story. This "Star Wars Story" did not demand to be told for thematic or character-driven reasons. It demanded to be told out of obsessive-compulsive completionism. So it’s easy to imagine why Lucasfilm would have originally hired Phil Lord and Chris Miller, the comic geniuses behind “21 Jump Street” and “The LEGO Movie,” to direct it. “Solo: A Star Wars Story” could only have benefitted from a lighter tone, a playful wink to the camera, a humorous understanding of its lighthearted existence. But, as we all know, Lord and Miller were replaced mid-production by Ron Howard, an exceptional filmmaker but also an incredibly sincere one. His straightforward approach to this movie and its characters betrays the inherent humor of the material. Alden Ehrenreich and, in particular, Donald Glover appear to be playing the gag version of the film. Woody Harrelson and Emilia Clarke do not. “Solo” seems to be a movie at war with itself, and it’s not a very interesting war. “Solo” is not, however, or by any stretch, the worst “Star Wars” movie. It’s not even a particularly bad one. It’s just a misfired proton torpedo. “Solo” misses the exhaust port but it does some cosmetic damage anyway. There are action sequences that get a charge out of you, and some minor characters - particularly L3-3T - that steal some scenes, but they make no lasting impact, and they add nothing of real significance to the overall “Star Wars” story. Maybe some "Star Wars" stories don't actually need to be told. In concept, I think having the "A Star Wars Story" one-shots is a very creative way to expand their universe and deviate away from what the main storyline is tackling in the episodic numbers, but from what was put out before (Rogue One) and now seeing the trailers and reading reviews to this (Solo) makes me question why I should care about these stories. I left Rogue One with the idea of "Why did this need to be a movie?" In all of Star Wars canon why did it benefit Disney to produce this as a movie and not a comic mini-series, or a book? Your last line perfectly sums up how I'm starting to feel about these "side stories" of the Star Wars universe and ultimately that was my biggest fear. Also, I freakin' love that you didn't put a rating on your review! It really made me appreciate your full review more. Thank you for your feedback! I'm usually not a fan of "ratings" but I do understand the need for clarity, especially for those who use film criticism to help make decisions about which films to see (and not see). That's something we have to be constantly mindful of, even if we don't use them. The thing that bugs me is the fact that Disney is willing to make it a trilogy. The existence of this movie is pretty useless if you ask me, but make the origin of Han a trilogy ? Come on ! Thank you for reading! The site design is simple right now for two reasons, partly because we wanted something simple and direct, so as not to distract from the content, and partly because we can't afford a designer right now. Hopefully in the nearish future we'll be able to do an overhaul!